- Milk Protein Peptide has a potent anti-microbial property and regulates sebum secretion. - Selenium improves acne symptoms and protects skin against free radicals. 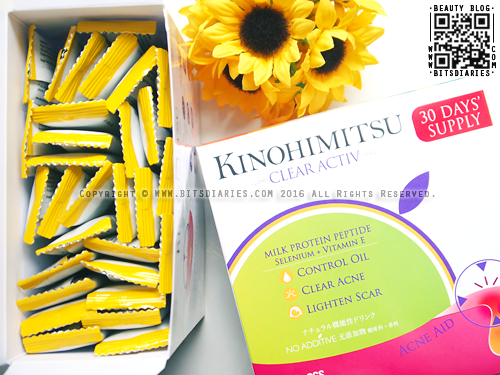 - Vitamin E moistens the skin and speeds up scars healing process. It plays a synergistic role with selenium in improving acne lesions. - Amla Fruit Extract promotes liver and skin detoxification to reduce skin irritation and blemishes. 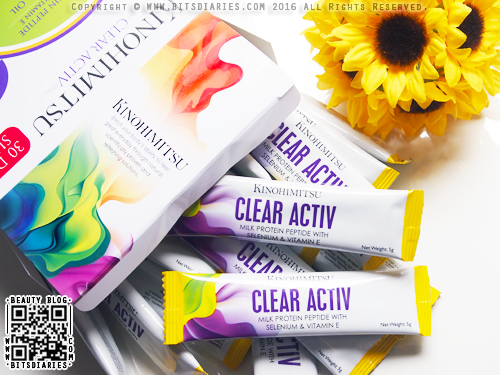 The best part of Kinohimitsu Clear Activ is that it's 100% natural and sugar-free!!! It contains no preservatives, additives, hormones, artificial coloring and flavoring as tested by SGS. 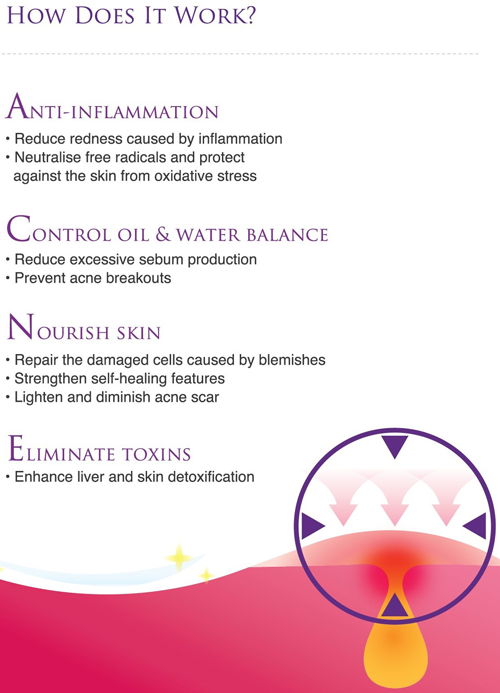 A natural remedy for acne~! Each box comes with 30 sachets. 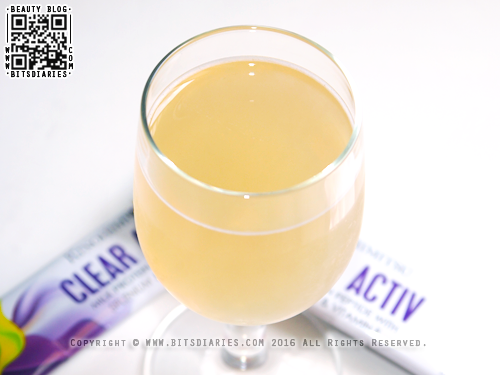 Who should consume Clear Activ? 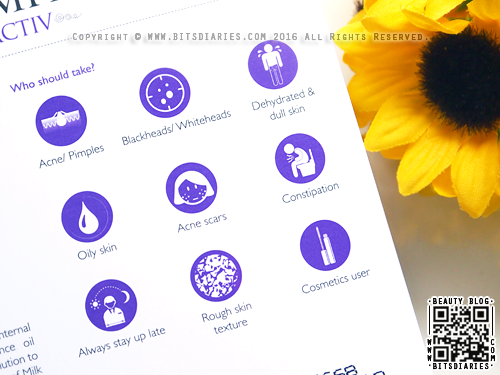 It is suitable for people who have acne problems. - If you are having outbreaks, take 2 sachets daily. - If you have acne-prone skin, take 1 sachet daily. - If you get pimples occasionally, take 1 sachet every 2 days for maintenance. 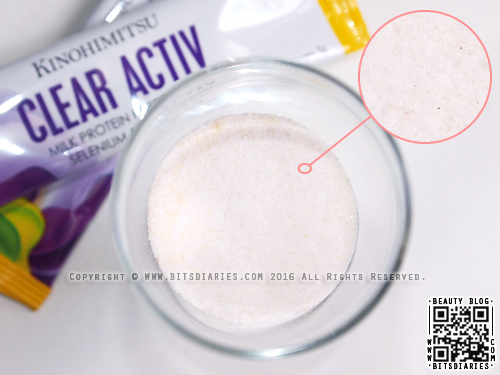 Simply mix a sachet into 80ml of water. It is recommended to consume before breakfast or before bedtime, and it can be served chilled for a delicious taste. The drink tastes like a combination of peach and passion fruit. In my opinion, it tastes better when chilled. So I usually just mix it with ice water. 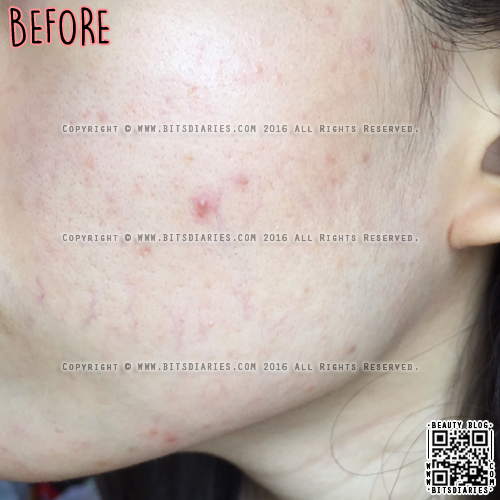 Just some side information: During the trial test, I stopped using Hiruscar Post Acne Gel, so that I can test the effectiveness of this product in treating post acne marks/scars, which it claims to do. But I'm still using skin care products designed for acne-prone skin — Etude House AC Clinic range. 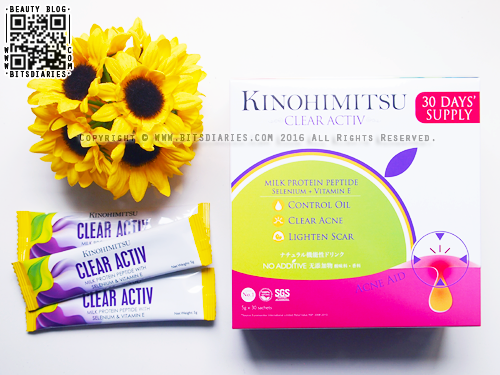 After taking Kinohimitsu Clear Activ for four months, I have noticed that it speeds up the healing process of my pimples and post acne marks/scars. It also reduced my acne outbreaks as well. FYI, I will still get pimples, but it's only a few zits and happens only once in a while. So I would say it doesn't totally stop acne from coming out to play, but it greatly reduces the occurrence and keeps them at bay. Aside from that, I also noticed my skin is smoother and less oilier. Bear in mind that it took me four months to get this results. So don't expect miracle to happen overnight; it takes time. Also take note that the results may vary individually. Some may see immediate results while others may take longer time. 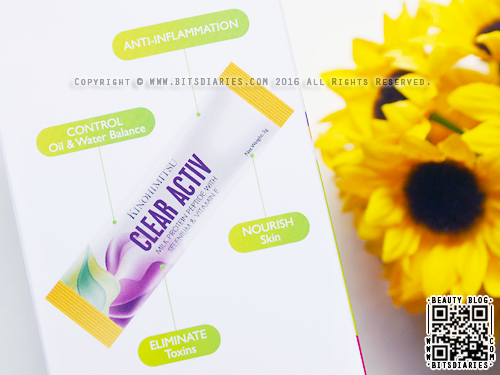 For your information, I took 5 boxes of Clear Activ in total. Initially, when I was having outbreaks, I took 2 sachets daily. (That means a box can only lasts for 15 days.) Then when my pimples were healed and left with only post acne marks/scars, I reduced to 1 sachet daily. Currently, I'm taking 1 sachet every 2 days to maintain my skin condition. 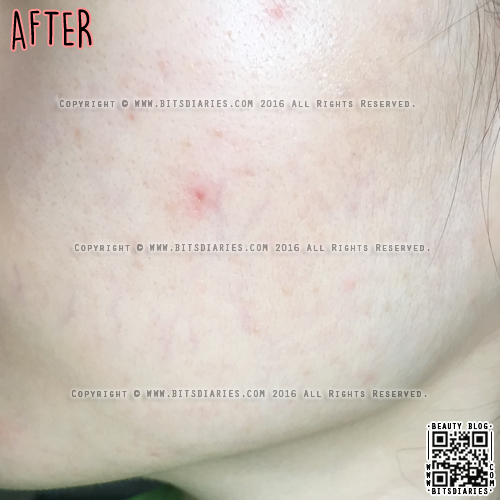 Overall, I would say it works to clear acne and fade post acne marks/scars from the inside out, and keeps them at bay — but it takes time and lots of patience. For more information, check out Kinohimitsu's website.